Just as Tecno released the Mancity edition of the Camon CX, Oppo has launched the Barcelona Edition of the Oppo R11 called Oppo R11 Barcelona Edition. If you are a die-hard Barca fan, this device is specially made for you. The phone is branded with Barcelona's color and club logo at the back. At that, it comes with great specifications and features which is almost similar to the unbranded Oppo R11. 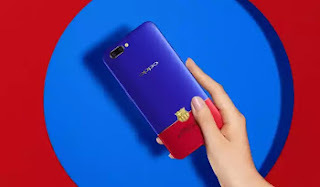 In this post, I have highlighted the specs and features of this customized Oppo R11 Barcelona Edition. Kindly read on. The Oppo R11 Barca Edition runs Android 7.1.1 Nougat which is based on Color OS 3.1 (which does not allows users to access all features of Android OS) & packs with a 5.5-inch FHD (1920 x 1080 pixels) Display. The device comes with a 2900 mAh non-removable battery and powered by a Snapdragon 660 octa-core processor. The smartphone features 4GB of RAM and a 64GB inbuilt storage with hybrid sim slot. There's also a Dual camera 20MP+16MP Rear camera with dual LED flash and 2x Optical zoom, and 20MP selfie camera with 5P lens and f/2.0 aperture. The phone also features a fingerprint scanner. In connectivity, It includes 4G LTE, Wi-Fi 802.11 a/b/g/n/AC, Bluetooth v4.0, GPS/ A-GPS, 3.5mm audio jack, and Micro-USB. Coming to the price aspect, Oppo R11 Barcelona Edition is priced at $479 in US, 3199 Yuan in China, Rs. 30,500 in India and about N170,000 in Nigeria and will be available from August 18 2017. Will you rock this smartphone when it's out? Also tell me which club you support. For me, i ain't a football lover. Good phone but why 2900mAH battery to this kind of a phone. I will now buy a 2900mah battery am a Barça fan. Kolewerk. wow the phone is nice.wise to afford it someday.